A new Facebook Help Center article makes it easy to check if your information was shared with Cambridge Analytica. 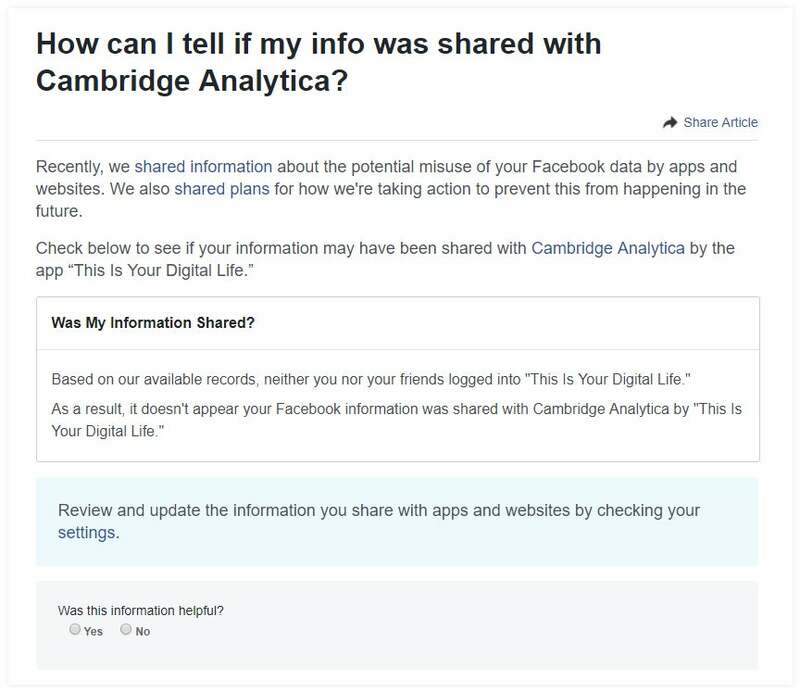 Update (4/10): Facebook has put together a Help Center article that makes it easy to check if your information was shared with Cambridge Analytica via the This Is Your Digital Life app. When I checked on Tuesday morning, it said my account was unaffected. "Based on our available records, neither you nor your friends logged into 'This Is Your Digital Life,'" Facebook wrote. 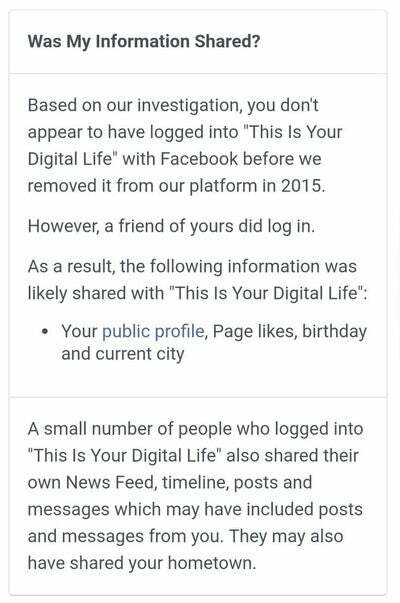 "As a result, it doesn't appear your Facebook information was shared with Cambridge Analytica by 'This Is Your Digital Life.'" Are you one of the 87 million people affected by the Cambridge Analytica data leak? Starting today, Facebook is adding a note at the top of News Feeds that will let you know if your information was improperly shared with Cambridge Analytica. 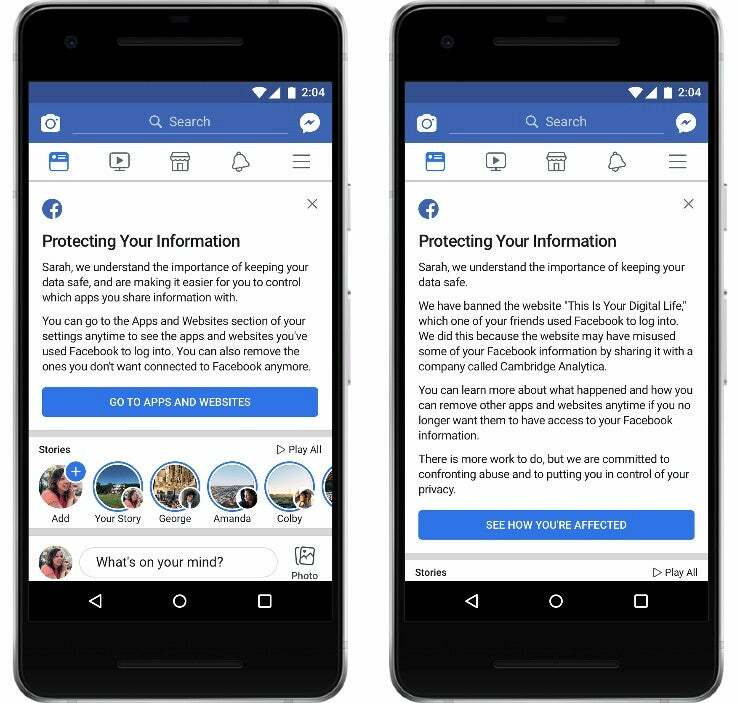 Facebook will show you one of the two messages below: If your data was included in the leak, you will see the message on the right; if not, you'll see the one on the left. "We have banned the website 'This is Your Digital Life,' which one of your friends used Facebook to log into," the message for affected individuals reads. "We did this because the website may have misused some of your Facebook information by sharing it with a company called Cambridge Analytica." Facebook goes on to say that it's "committed to confronting abuse and to putting you in control of your privacy." Under the message will be a link where you can learn more information about the leak and see how you're affected. Whether you're affected or not, it's smart to visit your Facebook Settings and remove all the apps and websites you no longer want connected to your account. For detailed instructions on how to do that, head here. Thus far, the alerts have not yet rolled out to anyone at PCMag, but it's still early on the West Coast. Since thisisyourdigitallife provided access to users' friends, the leak extended well beyond the 270,000 people who downloaded the app. After calculating and tallying up the maximum possible number of friends each person who downloaded it had at any given time, Facebook last week said the leak affected up to 87 million people, most of whom reside in the U.S. Meanwhile, Facebook today confirmed it has suspended another developer, CubeYou, for allegedly engaging in Cambridge Analytica-style data collection tactics. The CubeYou discovery comes as Facebook CEO Mark Zuckerberg prepares to testify before Congress this week about the Cambridge Analytica leak.